Read out or Delete the BIOS password successfully . Your security awareness has become a curse for you.You now want to reconfigure your BIOS but have forgotten the password to it? Well,Here is the solution! RTC' or 'CMOS Reset'in the manual of your motherboard. (if you don't have the manual,you can download it from the manufacturers website if required).The instructions are often 'Jumpers' chapter. 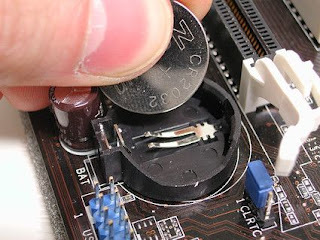 If your motherboard does not have a suitable jumper,then you can try resetting the BIOS RAM values to default by removing CMOS battery.Always disconnect the computer from the main plug.Remove the lithium button cell and place a coin of similar size in the battery holder(short out the pins).This ensures that any residual voltage holding the content of BIOS memory is done away with.Now wait for at least 10 minutes (15min. If you are in a cooler area) before removing the coin and re-positioning the battery.During the booting process,enter the BIOS and load the default settings.You can re-configure BIOS after restart.This does not usually work for netbooks,laptops and notebooks.In this case,you should seeek help from the manufacturer's help desk or service center.